Floyd Mayweather has retired from boxing but he didn't retire to a small pension like most of us will. This guy hung up his gloves with millions in the bank. And rightfully so. You could easily argue that he was the sport's main draw for at least a decade before he decided to call it quits. Now that he's made the commitment to come out of retirement to fight UFC superstar Conor McGregor, he's got another chance to add to the pile of cash that make his net worth almost unbelievable. At 40 years old, Mayweather is already an incredibly wealthy man. OK, he's put his life on the line from time to time to achieve that but how many millions does he have in the bank? This guy's worth every penny. He equalled Rocky Marciano’s record of 49 matches unbeaten when he beat Andre Berto on points and when he faces McGregor, he has the chance to go 50 wins and 0 loses. Mayweather must be so glad that he came out of retirement having originally hung up his gloves in 2008. 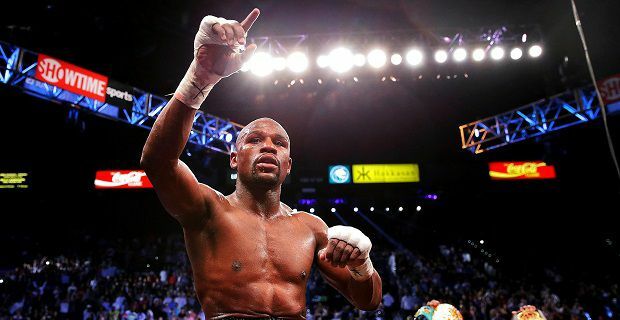 This second return to the ring against the MMA superstar probably won't offer Mayweather his greatest challenge but we expect the fight to be the most watched of the American boxer's long career. For that fight in the T-Mobile Arena in Las Vegas he'll be getting around $400m mainly due to his larger slice of the pay TV revenue from the fight. When we tell you his net worth, you'll realise why he mentioned the amount of money he can expect from his upcoming fight. At the moment, Forbes estimate that the fighter is worth $340m. The fight against McGregor is likely to double the man's worth in one night. No one he's decided that retiring back in 2015 isn't a decision he will stand by.